What's big, silent, and slices through clouds like a SR-71 Blackbird in a bit of a hurry? If you guessed the Volkswagen I.D. R Pikes Peak, you're right. But no cigar, because, let's face it, having a photo of that very machine right here has helped considerably. But if you think you're so clever, have a go at this one. What's relatively small, hisses, crackles, sputters like the Incredible Hulk, and, rather like the good Dr. Banner gone bad, manages to move much faster than it looks? Give up? Well, it's a rather unusual machine - the Volkswagen Golf 2 Bi-Motor Pikes Peak. And if we're to tell you the story of the I.D R Pikes Peak, we first have to set our time machines to 1987, and take you back to when the hill climb was still gravel. See, back in '87, it was this Golf Bi-Motor that VW took to the Pikes Peak International Hill Climb, piloted by the mild mannered Klaus-Joachim Kleint. The car that "Jochi" was driving, was no ordinary Golf though. It had started out innocuously enough. A simple machine with a 1.8-litre turbocharged 4-cylinder engine that had a power output of "just" 320PS. But with no wings, and no downforce, which could make things tricky at the course. So the engineers decided that it would be best if they tried to distribute the power and weight, a little better. They custom-built a clam shell at the back, and added another engine of exactly the same specification in the rear. Then they sent Jochi off to try and master the hill climb in that 652PS beast that rorted and snorted in the front, and roared and growled at the back. Kleint was a cautious driver. He knew that despite the many smiles and the maniacal laughter that would be induced by going sideways, the goal was to lose as little time as possible. So he decided to drive as smoothly as he could, keeping the showboating to a minimum. He tackled 153 corners in this manner and was even faster than Walter Röhrl in the Audi Sport Quattro E2 Pikes Peak over the first sector. But then, with only three corners left and the chequered flag visible in the distance, things came undone. Literally. A uni ball malfunctioned, causing the wishbone to work itself loose, after which a wheel fell right off the car. On a course as narrow as Pikes Peak, and at an altitude of 14,115 ft, the last thing anyone wants is a runaway wheel! "I was very sad, when it happened," Kleint says to me of the incident, getting a faraway look in his eyes. He remembers, he says, having to trudge the rest of the way on foot, which wasn't how he'd planned to cross the finish line. One feels bad for Kleint, naturally. Not only because he came so close to winning Pikes Peak, but also because he's had to spend the last 31 years describing, in agonising detail, those final three corners of the hill climb to pesky journalists such as myself. 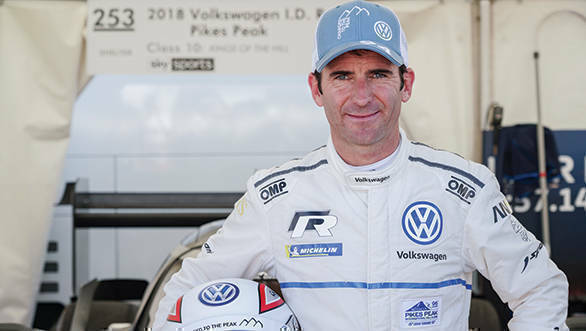 It was around the time that Kleint was competing at Pikes Peak, that there was a little bright-eyed young boy in Ales, France, who was closely following what happened at the mountain. France's Michele Mouton, often considered one of the finest, fiercest women in motorsport, had won the hill climb in 1985, and young Romain Dumas was very impressed. He'd spend hour after hour watching video footage of PPIHC, determined that he'd go compete in it some day. That day came in 2012. Dumas was all grown up, and had one Le Mans 24 victory under his belt already. And off he went to Pikes Peak in his own Porche 911 GT3R. He didn't do too badly, setting the second-fastest time overall, and winning the open class of the event. "Then I said, I will never go back!" Dumas says laughing. Dumas is quick-witted. There's no question that he doesn't have a well-thought-out answer to, or a quip ready to deliver at a moment's notice. His eyes have a merry twinkle in them, there's something almost elf-like about him (if he lived in the North Pole, you can be rest assured he'd be the smartest of Santa's little helpers), and it seems like he talks as fast as he drives. But he's no sore loser, which is why he explains the reason he left Pikes Peak a little displeased that year. "They arrange a little bit the rules, and when you go with your own money and your own car, of course, this is not nice," he says. It's been some years since that first attempt at the hill climb though. 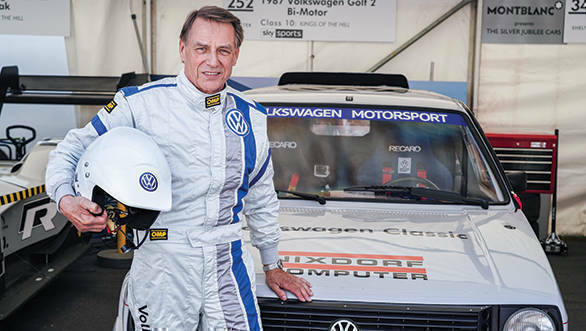 He's now won the event four times, most recently in the VW I.D. R Pikes Peak. A machine just as unusual as its predecessor from all those many years ago, although a little more futuristic. And a machine that is a combination of Dumas' experience at the mountain in Colorado, Francois-Xavier "FX" Demaison's technical wizardry, Willy Rampf's aero expertise and Dieter Depping's testing skills. The I.D. R features a carbon fibre monocoque, that, with Dumas in the car, weighs just under 1100kg. And given the dimensions of the machine, that's no mean feat. Powering the 680PS beast are two electric motors, the batteries of which are charged by generators that use glycerol as fuel. Essentially, the message that Volkswagen seems to want to shout out is this - clean and green. While also making the case for electric mobility and their I.D. range of cars. 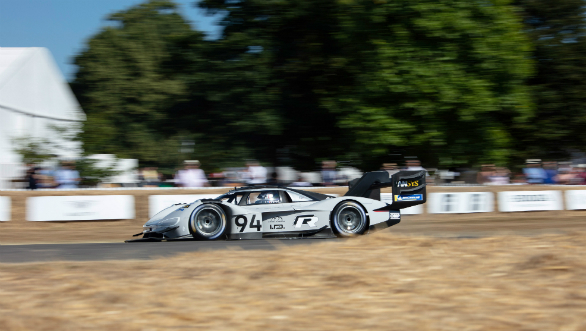 Needless to say, this then is a machine that Volkswagen is so proud of, that they've now brought it to the Goodwood Festival of Speed, to see if it can manage to crack the time for an electric vehicle at the hill climb - 47.34 sec - set by Jonny Cocker in the 860PS Lola-Drayson B12 69/EV in 2013. And even while they're determined to give it their all, as Dumas says, "Goodwood is a show, it's not a race!" Let's explain that statement for you. If Lord March's hillclimb is The Shining, hugely popular with people and attractive to Hollywood, the Pikes Peak International Hill Climb is House of Leaves - terrifying, punishing, you've to be made of incredibly stern stuff to get through it, but it's worth it in the end. At Goodwood, there are just nine turns over 1.86km. The run is over even before it begins. And, given that the I.D. R is set up for Pikes Peak, it's got far too much downforce for this track. But there's another reason Dumas doesn't think of Goodwood as a race. The rules really are a little flexible. Some cars manage to cut corners and gain time, which he can't do in the I.D R. Then there's the fact that the running order keeps changing. "Yesterday we drove first, today they say you drive last," he declares. Driving last isn't ideal, because a lot of dirt and grass gets thrown onto the track, which makes things tricky for people further down the running order. Whatever the case may be, even in the practice runs, Dumas has already managed to duck under Cocker's time, clocking in around the 45 second mark. "I think we can do a 43," he says, ahead of the Saturday qualifying run. But let's go back to three weeks before the FOS, when Dumas piloted the Volkswagen I.D. R Pikes Peak to victory at the hill climb. 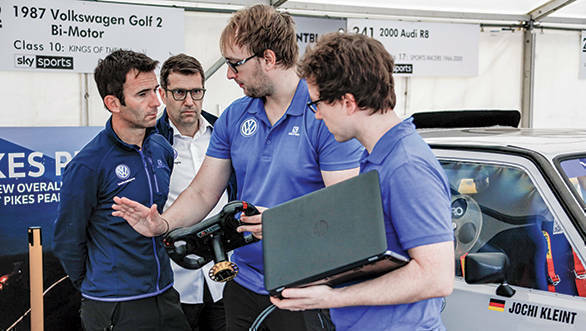 Not only did he manage to destroy the electric car lap record, he also managed to duck under the overall record of 8min 13.878sec set by Sebastien Loeb in a Peugeot 208 T16. Dumas' time of 7min 57.158sec is a whole 16 seconds quicker. And he's also become the first person to have ever managed to complete the course in under eight minutes. "I know Pikes Peak 100 per cent. 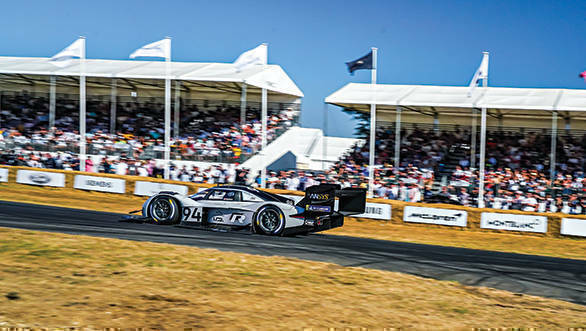 I know it better than I know Goodwood," he says, despite the fact that one course is just a 100 metres short of 20km, and the other course is just short of 2km. He tells us that despite the fact that there was fog that hampered visibility, he knew exactly where he was at every single corner during the Race To The Clouds. All of a sudden, Dumas reminds me of the mythical cloud-dwelling Sylphs, who are known, above all else, for a remarkable ability to see things before they happen. A handy skill to have when you need to tackle 156 unpredictable corners! 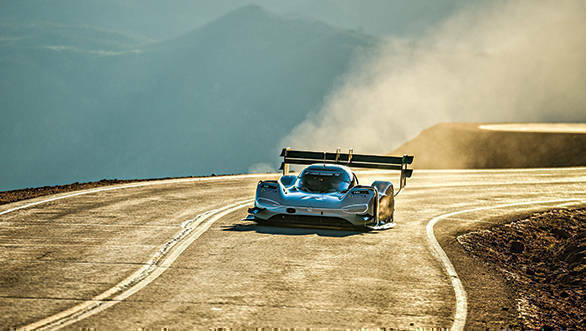 But there's so much more to success at Pikes Peak, than just knowing the track. In order for a run at this most treacherous of all hillclimbs to be successful, in conditions that are ever-changing, the Volkswagen Motorsport crew have approached the entire event the same way NASA would approach the launch of a space shuttle. They've taken no chances in certain aspects. But for things that are uncertain, they've relied on Dumas' experience and presence of mind. As one climbs the mountain, the change in elevation leads to changing weather conditions that have a bearing on the performance of the car. The advantage of running an electric car has meant that an increase in altitude causes no loss in power. But braking temperatures, tyre pressure and the like are still affected. They've had to count on Dumas' expertise at Pikes Peak, his knowledge of how tyres work over the entire course, that includes a mid-speed section, a series of hairpins, long straights and a section of consecutive high-speed corners. And Dumas has had to rely on his gut more than ever before, because the I.D. R is so silent, noise is no longer an input he can rely on. And, the car has no gears, which means he cannot tell what speed he's doing in each corner, something that he's otherwise quite good at. Dumas and FX both insist that for this particular record, trust has been key. What about the record at Goodwood then? To begin with, Dumas is driving the spare car, and not the actual machine that he won Pikes Peak in. This car is built to suit the taller Depping. And there are no spares if anything goes wrong, since these are all still on a ship headed back to Europe. But in qualifying at Goodwood, Dumas does as he promised, clocking 43.05sec. 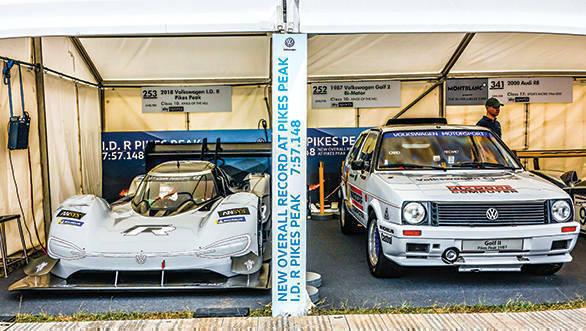 The following day, running last, and having to deal with all the grass and mud thrown onto the track by Peter Dumbreck in the Nio EP9, he still manages a time of 43.86sec, breaking Cocker's record. After he's celebrated the record at Goodwood with a glass of champagne, Dumas tells us that the overall time of 41.6 sec held set by Nick Heidfeld in the McLaren F1, should still be within reach in the I.D. R. Perhaps another day though. But there's another reason that he's enjoyed the entire I.D. R Project as much as he has. Despite the fact that he is a mechanical whiz, who genuinely likes the engineering aspect of motorsport far more than most drivers, and is constantly tinkering with and developing his own race cars at his workshop in Ales, he tells me that "the human experience of this project was unbelievable." It makes me think that there's still a little element of the "people's car" in the I.D. R Pikes Peak then, even though it might look nothing like the original "Volks"wagen.